Many have likened the young North Korean leader to his grandfather, North Korea’s founder and eternal president Kim Il-sung, based on similarities in their external features. But last week, Kim Jong-un demonstrated that he shares more than his grandfather’s characteristic round face. Through the sudden removal and brutal execution of his uncle Jang Song-taek, Kim Jong-un has brought a political tradition back to North Korea that Kim Jong-il never fully employed, but which Kim Il-sung skillfully mastered: the public political purge. Twelve officials were purged and put on trial for high treason, allegedly having plotted to overthrow the government. Ten were executed on trumped-up charges of spying for the U.S., with one admitting to being “a running dog of American imperialism.” Two years later, in another trial, Pak Hon-yong, one of Korea’s most prominent communists, was executed as an “American lackey” and, in a striking similarity to Jang Song-taek, for having lived a life of luxury through embezzled funds. The tradition of purges continued. In August 1956, when Nikita Khrushchev’s secret anti-Stalin speech was still sending shockwaves through the communist world, a very real attempt was made to remove Kim Il-sung from power. During a meeting of the Central Committee of the Korean Worker’s Party, two factional groups voiced their criticism of party policies (particularly the Stalinist emphasis on heavy industry) and the personality cult surrounding Kim Il-sung, and demanded change. The factional groups consisted of politicians who had begun their careers in exile in China and the Soviet Union, and who still retained government contacts in these countries. Even though both countries protested, Kim Il-sung went ahead and purged everyone within these factions who could potentially threaten his rule. This episode was so significant that it went on to be included in the official propaganda biographies of Kim. In official accounts, Kim’s critics are called “villainous anti-Party counterrevolutionary factionalists” and “traitors of the revolution.” The “traitors” were expelled from the party – some of them were prosecuted for their crimes, others simply “disappeared.” By the early 1960s, no threats remained, and Kim Il-sung was safe as North Korea’s sole ruler. 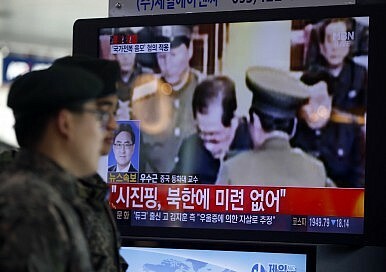 With the public trial and execution of Jang, Kim Jong-un has picked up an old tradition in North Korean politics, probably born out of his grandfather’s paranoia from his days as a guerilla soldier in Manchuria, where threats and collaborators loomed everywhere. The North Korean state rests firmly in its own history, and many political traditions have survived not only one but two generational shifts. Kim Jong-un has proven that he not only inherited his grandfather’s looks, but also his most brutal of political tools. Benjamin Katzeff Silberstein is a Korea Studies MA candidate at Johns Hopkins School of Advanced International Studies. Sanctions have not and will not stop the North Korean nuclear program. It is time to rethink U.S. strategy.